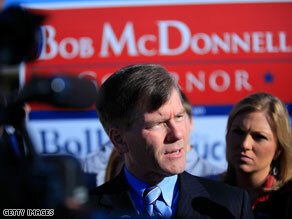 Republican Bob McDonnell captured the Virginia governor's mansion back from Democrats earlier this month. McDonnell, though, stressed that he reached out to Muslims and visited mosques in Virginia throughout the governor’s race and will continue to do so when he takes office in January. Muslim groups have called on McDonnell to condemn the remark because Robertson is a longtime political benefactor of the Republican, who won a blowout victory in this year’s closely-watched gubernatorial election. When asked if he believes Islam is “a violent political system,” McDonnell said no, but he did not condemn Robertson. Islam is a major religion, but "Islamic" fundamentalist extremists have their own twisted and perverse interpretation. People like Bob McDonnel and Pat Robertson make a mockery of Christianity with their warped views as well. Religious fundamentalists can't help but screw things up – no matter what religion. What Robertson said about Islam being a violent society was what Pope Benedict mentioned from a saying attributed to a churchman back in the middle ages. The Pope's reference to that old remark caused such commotion in the Islamic world that eventually the pope apologized. Robertson (as w/ our new VP) has a knack for stirring up controversy. There seems to be no current cure for diarrhea of the mouth! Pat Robertson speaks only for his own clergy, if they believe his crap then I feel sorry for them, but know this he is not the emperor of all Christians. Yep VA, see what you got now, a Robertson puppet... Congratulations! You should have paid more attention to that college paper. Sorry Virginians. You got what you wanted. Right from the start he is a "TYPICAL RIGHT WINGER". Wait until Rush, Palin, Beck, Hannity and the Congress woman from Mn come for his swearing in ceremony for more destruction to start. After 5yrs,be assured to be in more debt and middle class to be poorer than you are today. It is called the trickle down Economics or THE REPUBLICAN SONG. Here in Tx, the middle class (below 50k) pays more taxes than lets say someone like me above 80k. Hope you read State by State Tax report out today. It is all over Republican governed States except La. Im curious why most news agencies lean so far left these days. Kudos to this guy, he shouldnt need to disavow any opinion any american says. Its easily seen that along with the left comes limited free speech, limited reward for hard work, even intimidation at voting booths (think black panthers). But for some odd reason the msm isnt commenting on the obvious loss of rights we are seeing. Especially coming from Robertson that statement seems very ironic. He is the very embodiment of aggressively misusing christianity for political ends. Appalling, free speech or not it exemplifies why America is seen by Islam as attacking its faith and therefore justifies Jihad. He is frankly just as extreme as those he criticises. He needs lesson in the Tolerance of Intolerance just as the islamic extremists do and approach the issues from the point of view of understanding, not ignorrance. If America is dumb enough to give power back to the party that created this mess, I do not want to hear one complaint. Eat whatever meal they dishup, including intolerance.